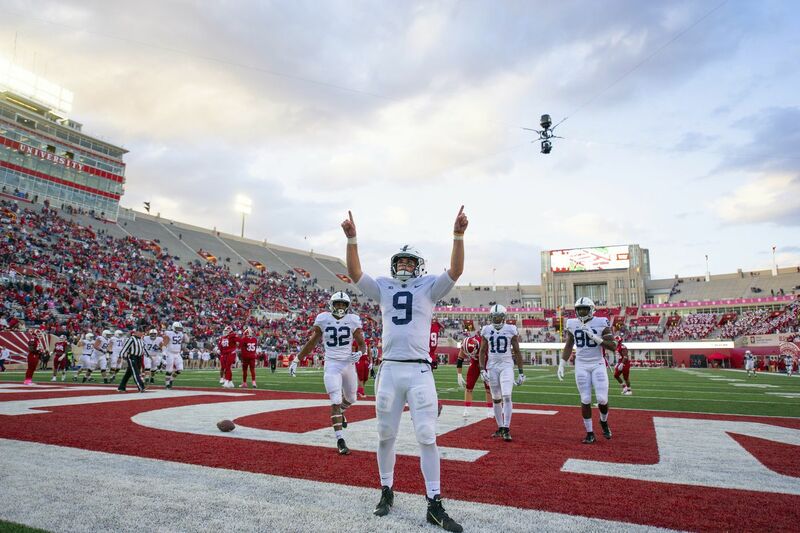 Penn State quarterback Trace McSorley (9) reacts in the end zone after scoring during the second half of an NCAA college football game against Indiana Saturday, Oct. 20, 2018, in Bloomington, Ind. Penn State won 33-28. BLOOMINGTON, Ind. – Penn State's Shaka Toney spent the fourth quarter of Saturday's game against Indiana spreading mayhem throughout the Indiana backfield, posting all four of his sacks in the final 15 minutes of the Nittany Lions' 33-28 victory. But Toney, a redshirt sophomore from Imhotep Charter, didn't do anything close to resembling a celebration after each sack of Hoosiers quarterback Peyton Ramsey. He just picked himself off the ground and quickly lined up to be ready for another play from Indiana's up-tempo offense. "I'm not a big up-and-down guy," Toney said. "I'm real mellow, real laid-back, just a kid from West Philadelphia. I've been playing football my whole life. When you make plays, my high school coach always taught me, when you make plays, act like you're supposed to make them." Toney and defensive Yetur Gross-Matos accounted for all six of Penn State's sacks, with Gross-Matos getting two. Toney said relentless play is what each member of the defensive line expects of himself. "We set levels on how we play," he said. "As a defensive line, we pride ourselves on making sure we keep going, don't give up on the rush. You never know what's going to happen." Penn State's receivers continued to drop the football, with five more passes that hit the ground, but should have been caught. Well, one of them didn't hit the ground, but the pass that slipped through the fingers of Mac Hippenhammer was intercepted by Indiana's Bryant Fitzgerald on the deflection. It's a conundrum to head coach James Franklin, who had to go deep into his receiving corps because of injuries. He did not specify who was injured, but starter Juwan Johnson and fifth-year senior DeAndre Thompkins were not seen for much of the second half. Franklin said the coaching staff will go through the game tape and the upcoming week of practice before deciding on the rotation that "gives us the best chance to win." "It was nice to see those [young] guys go in and do a pretty good job for us," he said. "I think they've shown they deserve more opportunities. Maybe the rotation will change a little bit, but it's all going to be based on the film and based on how practice goes this week." Quarterback Trace McSorley saw his streak of throwing at least one touchdown pass in a game end at 34, going back to the final game of his redshirt freshman year. The closest chance came in the third quarter when his pass in the end zone went off Brandon Polk's hands and toward K.J. Hamler, who tried mightily but could not keep one foot in bounds as he caught the ball. McSorley said he tries to encourage his teammates after dropped passes, and stressed the importance of quarterback and receiver having confidence in each other. "It's one of those things where we've got to have a good relationship and be confident in each other," he said. "It's just keeping those guys confident and keeping them up and letting them know that, 'Hey, I'm going to keep coming back to you.' Even though that happened, you move on and keep their spirits up." Starting safety Garrett Taylor was ejected from the game for targeting midway through the third quarter and will not be eligible for the first half of next Saturday's game against Iowa at Beaver Stadium. … Freshman kicker Jake Pinegar saw his streak of 37 consecutive extra points to start his career snapped when his point-after try after the Lions' third touchdown was blocked. Pinegar kicked field goals of 27 and 32 yards and is now 6-for-10 on the season.